I have a '73 CB500. The wheels are serviceable, but not what I want - the hubs are tarnished, spokes are rusty and crusty, the rims are nicked and scratched. 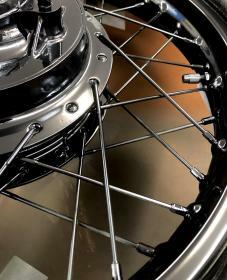 I'd like to trash the spokes and rims, refurb the hubs and build wheels with new spokes and new rims. That's where I run into the ignorance wall... I know nothing about these old bikes. This is my first motorcycle, and I'm learning as I go. This particular CB500 will never be invited to the Concourse de Anything. It's way beyond returning to 100% stock. But, I'm not building a slammed cafe racer either. Just updating, painting, redoing some wiring, new brakes, etc. 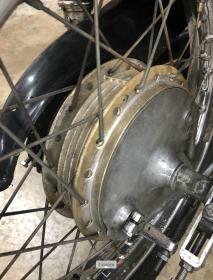 I'm not going to race (or go over 60 mph ) ... don't want $1,500 wheels on a $1,500 motorcycle. Any guidance on the right rim and spoke combo would be greatly appreciated. Last edited by OldZaskar; 03-23-2019 at 07:41 AM. Ya know, you can get a cheap wheel truing stand @ Harbor freight for forty bucks. Lacing is something I've long admired but never (yet) tried. I do know that forking something up trying to do it yourself, THEN taking it to a pro to be straightened out, is a very poor way to establish a working relationship with said pro. Just gonna have to take my word on that one. Oupa - you speak the truth! I've been building, riding, racing bicycles for 45 years. I've developed relationships with the guys at the shop (many shops over the years) and have had to go in with my tail tucked many times... a few times with cupcakes (my daughter loves to bake), 12-packs... "Y'all aren't gonna believe how I screwed up the bottom bracket... "
But I do hope to find that balance - I want to learn to a lot of this on my own, but recognize these guys are pros for a reason. You have those wheels looking pretty good. There are several sets of spokes and wheels on eBay that are very affordable. I have used several of these without any problems. As for lacing and truing wheels, it is NOT that hard. Just take your time and DO NOT let OCD get you. I saw these on Ebay. But, my expertise peters out after "okay, round... check" "40 spoke holes... check"
Are these for a Twin or a 500 Four? 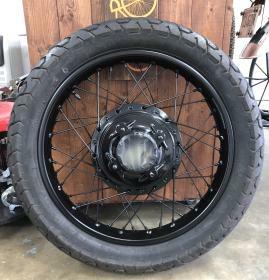 You want to choose rims with the correct width for your bike, at the point you're at some have opted to go one size wider on front and rear rims. This allows a better selection of available tire choices. What widths do you have now and what's your preference of tires? At this point you can shop around for the tires you want, then we can figure out if the correct rims are available and will fit your bike. Too wide will rub somewhere. Yeah, it's always best to forge that relationship before you have to drag in an accident. ...and bring cupcakes when you do have to drag one in. It's the strangers you've never seen before and you know you'll never see again (unless they screw up something else) who's jobs some craftsmen would rather just turn away. I "practiced" on old bike rims that were able to be disassembled... I read a chapter in a book by Billy Lane "bobber handbook".. it is a good chapter to start with. Doesn't answer questions like shouldered, steel, aluminum etc. I do know aluminum is lighter (for speed applications), but I'm sure if u find a pot hole a steel rim may prevail better.